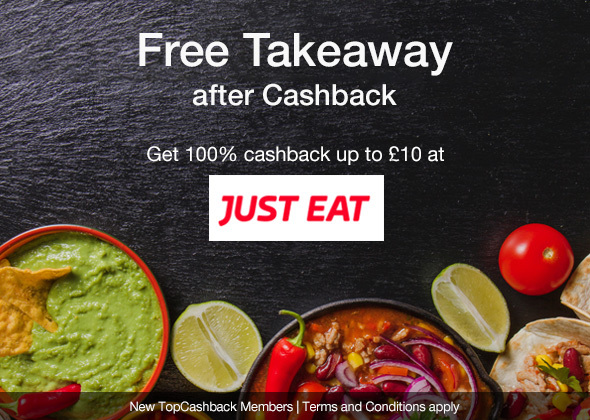 • Free Takeaway after cashback, means that TopCashback will refund 100% of the purchase order value up to £15 cashback on purchases at Just Eat. Purchases over £15 will receive £15 cashback. • The 100% cashback up to £15 at Just Eat start date is the 01/04/2019 and the offer end date is 01/07/2019 10:00. • 100% cashback up to £15 at Just Eat is only available for new members or those with no previous purchases or cashback through TopCashback. • If the individual making the transaction is a new member, the individual must first register as a member of TopCashback, prior to redeeming the “100% cashback up to £15 at Just Eat” deal. • TopCashback reserves the right to end the 100% cashback up to £15 at Just Eat deal at any time without notice. Purchases made after this time will not receive the cashback offer. This offer is limited to 5,000 redemptions on a first come first serve basis and is subject to stock availability. • Cashback earned in the 100% cashback up to £15 at Just Eat will not progress to payable status until approximately 14 working days after the promotion end date subject to a successfully tracked purchase. • Transactions may be made through desktops, tablets and mobile browsers. • Cashback earned in the 100% cashback up to £15 at Just Eat will only be available for pay-out via BACS payment i.e. paid directly into the member’s bank account. • Cashback redeemed from 100% cashback up to £15 at Just Eat, is excluded from Tell-a-Friend promotion thresholds. (Please see Tell-a-Friend page for more details). • This deal is wholly funded by TopCashback, not Just Eat. • Where there is a contradiction between the offer terms and conditions and TopCashback terms and conditions, the offer terms and conditions take precedence until the offer expires. • The promoter is TopCashback, Temeraire House, Nelson Court, Staffordshire Technology Park, Stafford, Staffordshire, ST18 0WQ. TopCashback is a trading name of TopCashback Ltd.
• Cashback earned in the 100% cashback up to £15 at Just Eat may track at a lower rate initially and will uplift within 14 working days of the promotion end date. • If the transaction for the 100% cashback up to £15 at Just Eat does not appear in your account, you can submit a claim. Any claims for this cashback offer will only be open for submission 14 working days after the promotion has ended.